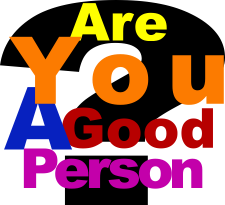 What we do there is have a sign that asks the question “Are You A Good Person?”, and as the rules of the event may allow, ask people to come in and take the Good Person test. In the tent we have a few tables, each table with a few pens and pads of paper and a few 10 commandments sheets which will be described below. We also may have other tracts/books available at the tent, or some other means to attract people to the tent, like free water or face painting. When they come in, we sit them down at one of the tables we have set up and set them down and have them do a memory quiz on the 10 commandments. We first walk them through the image sheet on this page and go through each of the commandments, explaining the picture next to the text of each commandment. We then have them study it for as long as they think they need, and when they’re ready, they turn over the image sheet which only shows the pictures, but no text, to help them remember. Then they write down a few words for each commandment, or whatever they can remember (order doesn’t matter). The test giver then will then go through the law, Way Of The Master style with them and show them how they fail to keep the law, God’s wrath that abides on law breakers, and if their mouth is shut under the law, we then give them the gospel of Jesus Christ. This has proven a very effective way to actually talk with people and answer real questions that they have and reach the lost. It’s been very encouraging to us to see the results of this technique.